As per the findings of an up-to-date intelligence study by Transparency Market Research (TMR), the global blister packaging equipment market is highly fragmented, with top ten companies reserving less than a quarter of the overall shares in 2016. Some of the key companies currently functional in the global blister packaging equipment market are Marchesini Group S.p.A., Bosch Packaging Technology, IMA Industria Macchine Automatiche S.p.A., Körber AG, Gebo Cermex, Uhlmann Pac-Systeme GmbH & Co. KG, Sonoco Products Company, Romaco Pharmatechnik GmbH, Fabrima Maquinas Automaticas Ltda, and CAM Packaging Solutions. Among these, Uhlmann Pac-Systeme GmbH & Co. KG and IMA Industria Macchine Automatiche S.p.A. are a little ahead of the curve, yet only managed approximately 6% of the global shares in 2016, individually. As per the projections of the TMR report, the demand in the global blisters packaging equipment market will exhibit a CAGR of 5.4% during the forecast period of 2017 to 2025. The global valuation of the blister packaging equipment market is estimated to reach US$3,261.6 mn by 2025, significantly up from its evaluated worth of US$2,035.9 Mn in 2016. The report detects that acquisition, geographical expansion, new product launch, and collaboration are some of the key strategies of the key vendors of blister packaging equipment market. For instance, in July 2017, Marchesini Group S.p.A. acquired 40% of Vibrotech S.r.l, which manufactures positioning and infeed systems for automated industrial processes. On the flip side, Bosch Packaging Technology established a new manufacturing plant in Nanjing, China, in August 2017, after the company launched new cookie packaging in the U.S. in July 2017. Based on product-type, solid packaging equipment accounted for 83% of the demand-share in 2017, and is expected to sustain its position throughout the forecast period, whereas on the basis of process type, the global market for blister packaging equipment gains maximum demand from automatic segment. Equipment-wise, rotary blister system are most profitable, while technologically, thermoforming is anticipated to sustain the strongest demand in the near future. Geographically, Asia Pacific was the most lucrative region, closely followed by Europe and North America. High possibilities of automation in packaging line, the growing need for modernization of manufacturing facilities in order to improve production efficiency and reduce product changeover time, and facilities reduction in labor and packaging cost are the major factors augmenting the demand in the global blister packaging equipment market. The TMR report observes diverse packaging requirements in various industries, particularly those pertaining to consumer goods. Machine buildings are integrating automation to help end users increase throughput by minimizing the degree of manual operation, increase operability of machines, and easily facilitate on-the-fly changes. Burgeoning demand for various goods is influencing manufacturers to exercise improved operation management strategies. Overall equipment efficiency (OEE) is an indispensable requirement of sustainable production efficiency and can be achieved by adopting robotic automation in processing and packaging units of manufacturing facilities. The lack of centralized purchasing and intensifying competition, particularly in the developed countries wherein a number of companies are venturing, is hindering the proper prosperity of the global blister packaging equipment market. Most manufacturers are dependent on various vendors of blister feeds used in blister packaging. Another obstruction to the market for blister packaging equipment market is the reluctance of consumers to adopt the automated processes. Many of them continue to depend on conventional mode of pharmaceutical packaging as it renders ease of machine handling such as bottles and containers. 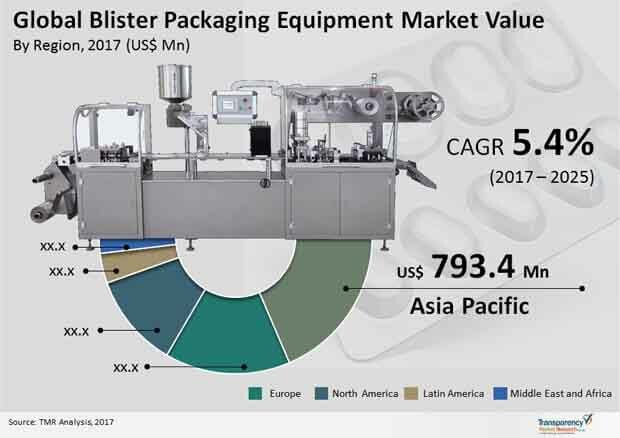 Nevertheless, increasing adoption of blister packaging lines to optimize production, shift away from fit-to-one concept, and opportunity for multiple product dispensing blister packaging are expected to open new opportunities in the global blister packaging equipment market.